This is a city of design and new technologies, of art and fashion. It seems that all these aspects have arranged to meet up in Milan to release an innate creativity and a desire to evolve. Therefore Milan is not just about business, Milan means, first and foremost, creativity and inventiveness. It is no coincidence that here, in the land of Saint Ambrose and Alessandro Manzoni, Leonardo da Vinci found the right setting for expressing himself and realising his great works. To get an idea of how artists, scholars, scientists and musicians were so inspired in Milan, it is enough just to pass a moment in front of "The Last Supper", spend a couple of hours in the Pinacoteca di Brera and the Museo di Storia Naturale (Museum of Natural History), lose yourself in the scenery of the Castello Sforzesco (Sforza Castle) or attend world class musical events at La Scala Theatre. This is a creativity that lives on and in the city there is a myriad of live music venues and stages for contemporary theatre. There are small cinemas in the centre and new-concept multiplex cinemas located around the city that offer a wide choice of films and latest releases. Milan is home to the Spazio Oberdan, the seat of the Italian Cinematheque, and has an array of venues for the showing of art-house films, retrospectives and original language films. The Lombard capital is alive with the spirit of initiative that also plays a role in new expressive arts, in modern dance and in the talent for gastronomy, both local and ethnic, that continue to reveal the character of the Ambrosian city and its cosmopolitan character. 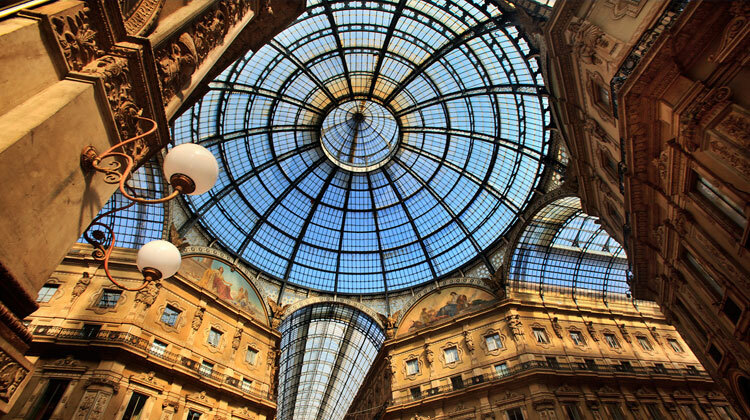 Prada, Gucci, Valentino, Armani, Dolce & Gabbana, Versace, Missoni, they all have amazing shops in Milan where you can spend a complete day wondering around the fashion streets of the Italian capital of vogue.